Flawless skin, beautiful eyes, enchanting smile, and slender figure, Deanna Durbin had it all. Deanna Durbin is one of those few who started her career as a child actor but with persistency they shone for a long time. Durbin born on December 4, 1921, was a famous Canadian actress and singer. From a very young age, Durbin was blessed with a mature voice. Her voice was soft, sweet, and melodious. That is why, Deanna Durbin was a big name in music industry too. At the tender age of 10, Durbin’s exceptional talent as a singer was recognized by her parents and they enrolled her in Ralph Thomas Academy. Durbin soon began singing at local churches and clubs. In 1935, Durbin was selected by MGM, for a role in the biographical film of the opera star, Ernestine Schumann-Heink. However, after the death of Heink, the film was cancelled but Durbin was signed for another film and she made her first appearance in a film called, Every Sunday. After her contract with MGM expired, Universal Studios took the opportunity of signing her. She appeared in the film, Three Smart Girls, which was a huge success. It is reported that Durbin’s film saved Universal Studios from going bankrupt. After that Durbin starred in successful musical films namely, One Hundred Men and a Girl, Mad About Music, That Certain Age, Three Smart Girls Grow Up, and First Love. After a successful career as an actress, Durbin decided that she had to take more music lessons for her singing. Durbin’s vocal coach at Universal Studios, Andres De Segurola had faith in Durbin that she would become an opera star. He closely observed Durbin’s performances. Till 1938, Durbin also worked in collaboration with Eddie Cantor but her workload for Universal forced her to leave the weekly radio appearances. From 1930s to 1940s, Deanna Durbin was ruling the film industry. She was equally popular in other continents as well. Winston Churchill’s favorite movie star was reported to be Durbin and it was reported that Durbin’s movies were first sent to Churchill and subsequently were shown to the public in cinemas. When the third sequel of her film, Three Smart Girls, was announced, Durbin held a press release to tell the public that she no longer intended to be a part of the film’s team and that she has decided to work as a solo artist. Durbin’s growing maturity was respected by the Universal Studios and she starred in movies, The Amazing Mrs. Holiday, Christmas Holiday, and Lady on Train, as her ‘grown-up’ movies. After the merger of Universal Studios as Universal-International, Durbin further worked on, I’ll Be Yours, Something in the Wind, Up in the Central Park, and For the Love of Mary, after which she decided to retire from acting. By the time Durbin made this decision, she was the second most highest paid woman in the United States and top-salaried woman in the United States. Moreover, her fan club ranked as the world’ largest during her active years. After her retirement was made public, many notable personalities tried to convince her to stay but she had had a decision. Durbin retired from acting at the age of 29. In 1982, MCA Records released a disc of her songs. In 1999, she sang as the Snowqueen on a three-minute, German short titled Love Is All, although, she didn’t appear on screen. She spent the rest of her life, privately in Paris, with her husband and children. 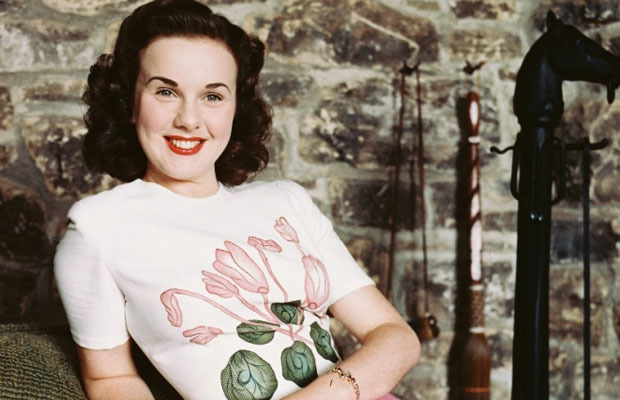 In 2013, Deanna Durbin departed from her fans forever. She was 91 at the time of her death.